Things We Like: Counting–er–Chasing Sheep! A while back I wrote about one of the Things We Like: Puppies in Bed. At that time, my girlfriend and I had just brought home a 10-week-old Pembroke Welsh Corgi. His name is Saké a.k.a. Mr. Bombs, and we’re pretty much obsessed. Today, our sweet little puppy has grown up into a big mutt. We still love him though, even if he is a bit of a bed hog. About a week ago we had our first puppyversary, which happens to be a day before my birthday, and marks the day Saké became part of our little family. To celebrate, we figured we needed to do something extra fun: a nice bottle of Saké (the rice wine) for us, and a herding lesson for Saké (the dog). We had been planning to bring Saké to test his herding instinct for some time. 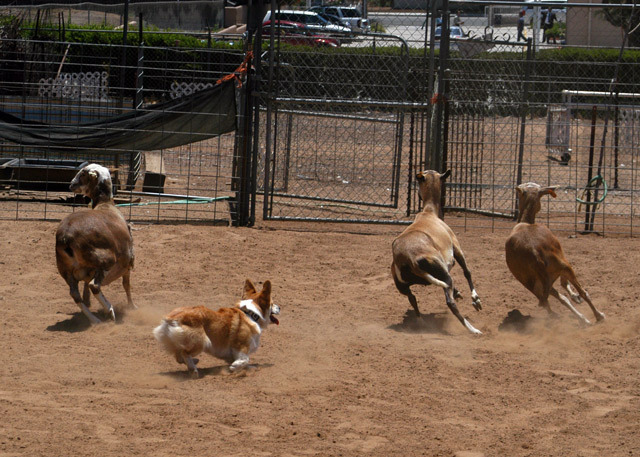 It all fell into place when we won free herding lesson in a raffle at the Southern California Pembroke Welsh Corgi Association’s annual Corgi Fun Day. Did I mention we were a bit obsessed? Anyways, fate had it in Saké’s cards to chase after sheep, and we weren’t about to stand in the way. We got to the ranch a little before noon last weekend, which was a bit of a drive inland for us, and about 20 degrees warmer. As soon as we parked inside the gates, Saké knew something fun was about to happen. There were a half dozen or so other dogs running around, and the energy was high. Surprisingly, the first half of the day was spent training us how to behave in the ring with the dog and the sheep together. Once we got that out of the way, it was time to see what Saké had. We knew he liked to chase dogs at the beach, but sheep? That was something we didn’t know. The trainer told us it would be a hard road to train Saké properly. 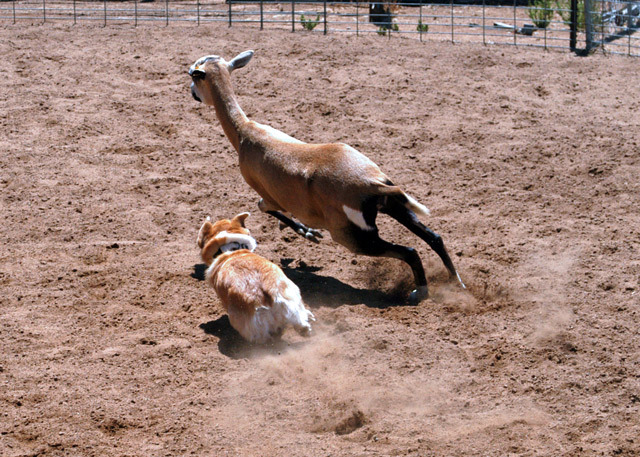 Corgis were bred to drive the sheep forward, and herding competitions require the dog to fetch the Sheep around to you. 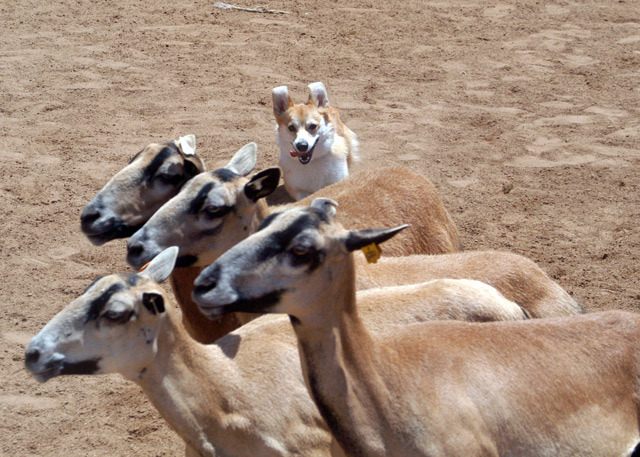 Thankfully, our retirement fund isn’t banking on Saké winning a herding championship. At first, he didn’t know what to do with the Sheep, but after a little encouragement he chased after them like you wouldn’t believe. After about five minutes of crazed Sheep chasing, Mr. Bombs decided he had enough. A quick rest, however, and he was back for round two – this time with more confidence. He was starting to get the hang of it. Alas, he had no more energy and it was time to call it a day. On the way home, we agreed that we had never seen Saké so exhausted before. He slept the entire way back. Actually, he was pretty sleepy for at least another 24 hours. The adventure and the heat had taken its toll on us too, and I think we were all ready for some well-deserved rest when we got home. Busy days indeed make for restful nights, and this was certainly an occasion. And the sun poured in like butterscotch and stuck to all my senses.. Recognize these lyrics? Well, my sister would. Besides being my culinary partner in crime, Janet also frequently serves as my memory. She correctly reminds me of what “really” happened when we were kids, clues me in on people’s names, and quizzes me on long-forgotten song lyrics. Janet has recently been sending me puzzling emails such as: “ladyfinger dipped in moonlight” Just listening to the Dead. Do you think they were referring to the cookie? Or: Picture yourself in a boat on a river, With tangerine trees and marmalade skies…..
Well, let me be fair. I may have started this chain of events when asking Janet for new ideas for my breakfast recipe posts. “What about food songs?”, she inquired. Great idea, Jan! First up, Joni Mitchell’s Chelsea Morning. Toast, oranges, butterscotch… What could be better for an unforgettable, lyrical breakfast in bed? P.S. Janet and I have started a list of suitable breakfast food lyrics, so please let me know if you have any we can add! Cut orange in half. Juice one half of the orange (should yield 2+ tablespoons). Slice the other half of the orange into thin slices. Set orange juice and orange slices aside. In small, heavy saucepan, melt butter over medium heat. Stir in brown sugar. Continue to cook over medium to medium low heat, stirring frequently, until mixture is significantly thickened, about 5 minutes. If using a candy thermometer, cook until the mixture reaches the soft crack stage (270° – 290°). Remove pan from heat and stir in orange juice. 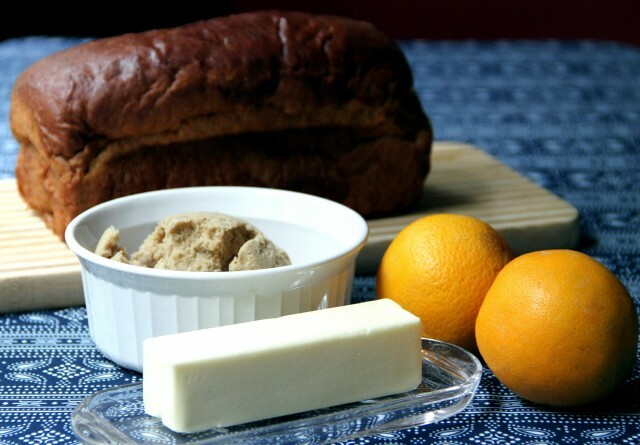 Pour mixture into small dish or ramekin, and refrigerate until firm enough to spread (1 to 2 hours). 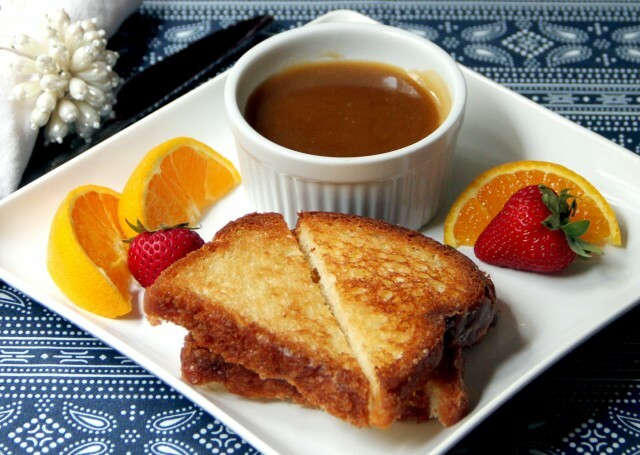 Serve with toast and orange slices. If you’d like to get a bit fancier with this recipe, try making French Toast (see Sonya’s French Toast for inspiration. 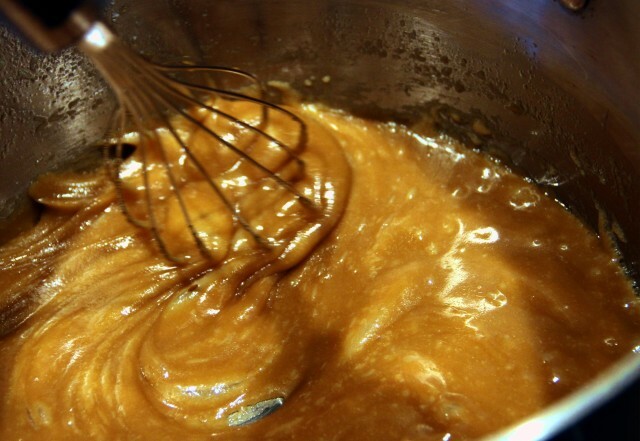 Then, after you’ve added the orange juice to your butterscotch mixture, stir in ½ cup to 1 cup of cream. 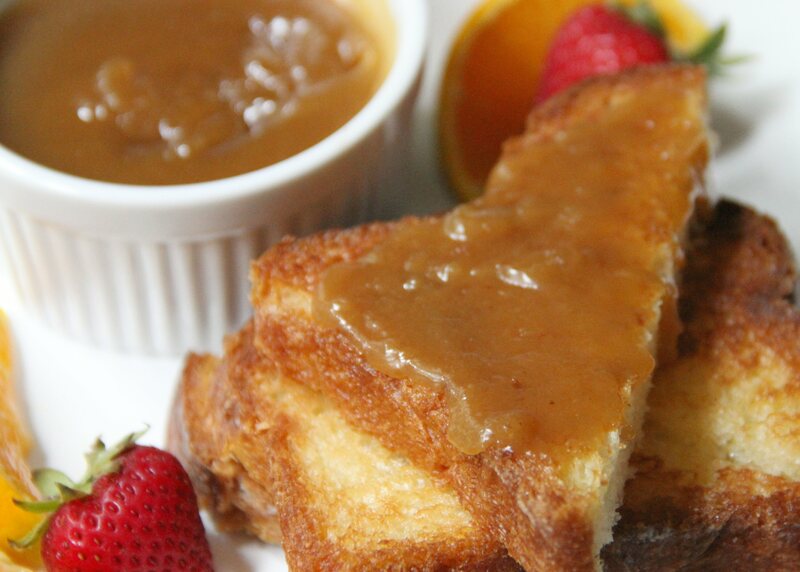 Pour over warm French Toast and serve immediately. Every fashionista has a little black dress (LBD) in her (or if you’re so inclined, his) closet. They know that black is a fashion staple. From a casual weekend outfit to a black tie affair, if this simple color can transcend time and trends, imagine what it can do for your bedroom walls. May I be so bold to state that most people, including myself, are reluctant, if not terrified of painting their walls a dark color? While white and its variants remain the most popular bedroom colors, black and its relatives can be just as versatile. Once of the most important things to do when going dark is to use premium paint colors. Pricey paint such as Benjamin Moore and Farrow & Ball are well worth the investment. You will be rewarded with an elegant, rich pigment. Another key point is to stay away from high gloss unless you have really, really flat walls. “Matt” (Matte) is your bedroom walls’ best friend. The walls in this master bedroom are painted Pratt & Lambert’s Wolf, “a warm gray with a hint of chocolate. White bedding, curtains, carpet, and slipcovers keep the room from feeling too cavelike. A 19th-century French armchair is covered in Rogers & Goffigon’s Olivia stripe in Argent and off-white.” Sara Scaglione is the mastermind designer behind this stylish dark hued bedroom retreat. A dark bedroom short on natural light can trick the eye with the use of artificial light and bright white decor. The dark gray bedroom walls of this modern bedroom are enhanced by the prevailing white arms of the canopy bed and pillowcases. The nightstands set a colorful, jewel tone in the room. Using white and other bright dominate colors to play off the dark walls will help highlight the opposing colors and bring an esthetic sparkle to the bedroom. Some people advise against painting a small space in dark colors, but I think this is where black can really have its moment. A dark bedroom can actually accentuate the cozy space. Not all the walls of a bedroom need to be painted the same color. Using the deeper color on an accent wall and surrounding it with lighter colors is actually one of my favorite techniques. The use of multiple but complimentary colors is an easy way to bring another eye-catching dimension to the bedroom walls. 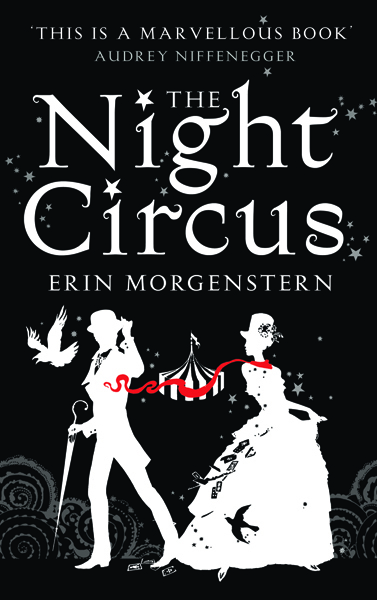 The most recent of these that I have come across is Erin Morgenstern’s debut novel, The Night Circus. It is, as you may guess, about a nocturnal circus, but it is also about so much more. It’s about rival magicians raising children to compete against each other in the showdown to end all showdowns. It’s about really cool clocks. And contortionists and twins with strange powers. Set in the late nineteenth century, it is reminiscent of Susanna Clarke’s Jonathan Strange & Mr. Norrell, which is about Victorian gentlemanly English magicians. But it is also very much its own novel. It revolves around the worlds of a strange circus, and those within it and those outside it. It’s lovely to read, and gives you great stuff for dreams. Hi, you don’t know me, but I’ve been watching you. Not obsessively, mind you—I sort of forgot you existed after The Doors came out, so you needn’t worry about me judging you on all the weight you’ve gained—but enough that I can say that your 1985 movie, Real Genius, is a touchstone of my childhood. Sure, you share that honor with vanilla Dunkaroos, an episode of Punky Brewster where the Space Shuttle Challenger blows up, and the television movie, The Deliberate Stranger, starring Mark Harmon as Ted Bundy, but nonetheless, my 12-year old self’s sense of humor is indebted to the collegiate shenanigans you effortlessly showcased in that film. 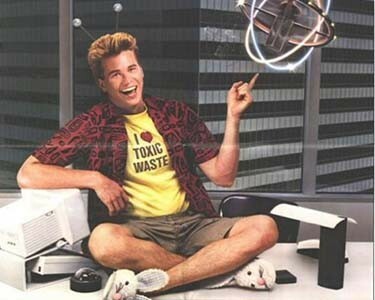 Upon the suggestion of a friend, I recently re-watched Real Genius in hopes of stoking those Betamax fires of nostalgia. There you were again, Val, looking as irreverent and crazy as I remembered, wearing an “I Love Toxic Waste” t-shirt whilst sporting toy antennas on your head—Fun! Unfortunately, you weren’t as funny as I once thought. In fact, aside from your penchant for always being in the right place for an 80’s synthesizer-set montage, you were kind of just there, smirking your education (and my time) away in flip-flops and hair gel. I’m sorry to say this, Val, but this time around I found myself far more fascinated by the unusual kid you take under your wing as your protégé. Y’know, the really smart one who looks like a cross between Tyne Daly and Martin Short? Yeah, that one. See, Val, I’ve grown up and with age, I guess, comes the realization that Real Genius, while still fun in a stay-in-bed-all-day kind of way, isn’t as groundbreaking a film as I remembered it to be. Sure, it may be one of the first movies to successfully combine advanced military weaponry with bikini-beach dorm parties and Jiffy Pop, but even amidst all those fluffy nuggets of combat, keggers, and comedy are kernels of unpopped gold. I know this is all so sudden and I apologize, but I didn’t realize until I saw you again that accentuating your character’s eccentricities by wearing bunny slippers to class just isn’t going to cut it in post-justaboutanythingsinceIwentthroughpuberty world. Times are tough, Val, and it takes a real genius to know when to up the ante. Until you figure it out, my eyes will be on Cagney… or is that Lacey? P.S. – If it helps, I’m pretty much over Dunkaroos too.